The Rodix Inc CE-40 Plus Series vibratory feeder controllers are designated with the CE mark for exporting to Europe. Features include line voltage compensation, soft start, maximum output adjustment, 4-20 mA and 0-5 vdc remote speed control. They are available as open frame style controllers for installing in larger control cabinets or as stand-alone controllers in Nema-12 oil resistant enclosures. Available in 120VAC and 240VAC, they can be built as single, dual or triple units. A Declaration of Incorporation is provided. 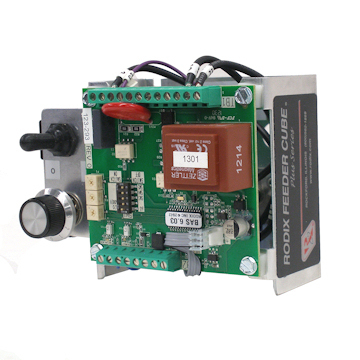 The CE-44 Plus Feeder Cube is a single, open frame FC-40 Plus Series controller designed for installing on a panel in an enclosure. The main control potentiometer and the switch are remotely mounted. The unit carries the CE mark and a Declaration of Incorporation is provided. Input voltage is 120VAC, 50/60 Hz. It is fused for 15 amps. 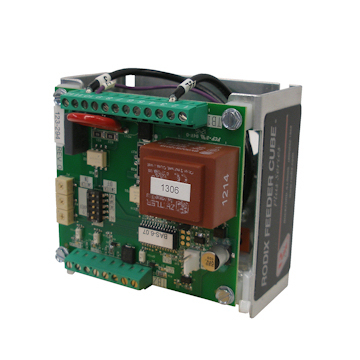 The CE-44-240 Plus Feeder Cube is a single, open frame FC-40 Plus Series controller designed for installing on a panel in an enclosure. The main control potentiometer and the switch are remotely mounted. The unit carries the CE mark and a Declaration of Incorporation is provided. Input voltage is 240VAC, 50/60 Hz. It is fused for 8 amps. The CE-41 Plus Feeder Cube is a single controller that carries the CE mark. It is housed in a Nema-12 oil resistant enclosure. Declaration of Incorporation provided. Input voltage is 120VAC, 50/60 Hz. It is fused for 15 amps. 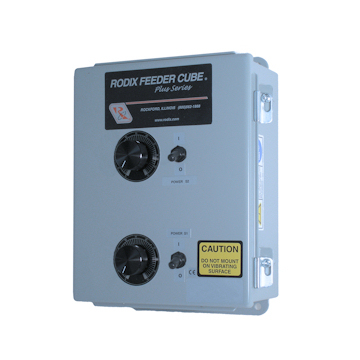 The CE-43 Plus Feeder Cube is a dual controller, housed in a Nema-12 oil resistant enclosure that carries the CE mark. Input voltage is 120VAC, 50/60 Hz. Unit A is fused for 15 amps and Unit B is fused for 5 amps. Declaration of Incorporation provided. The CE-48 Plus Feeder Cube is a single controller that carries the CE mark. It is housed in a Nema-12 oil resistant enclosure. Declaration of Incorporation provided. Input voltage is 240VAC, 50/60 Hz. It is fused for 8 amps. 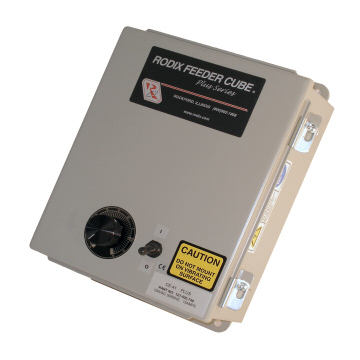 The CE-49 Plus Feeder Cube is a dual controller housed in a Nema-12 oil resistant enclosure that carries the CE mark. Input voltage is 240VAC, 50/60Hz. Unit A and Unit B are both fused for 8 amps. Declaration of Incorporation is included. The CE-101 Plus Feeder Cube is a triple controller housed in a Nema-12 oil resistant enclosure that carries the CE mark. Input voltage is 120VAC, 50/60 Hz. Units A is fused for 4 amps, Unit B is fused for 15 amps and Unit C is fused for 1 amp. Declaration of Incorporation included. 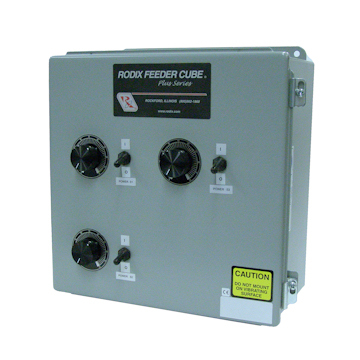 The CE-108 Plus Feeder Cube is a triple controller housed in a Nema-12 oil resistant enclosure that carries the CE mark. Input voltage is 240VAC, 50/60 Hz. Units A and B are fused for 8 amps and Unit C is fused for 1 amp. Declaration of Incorporation provided. 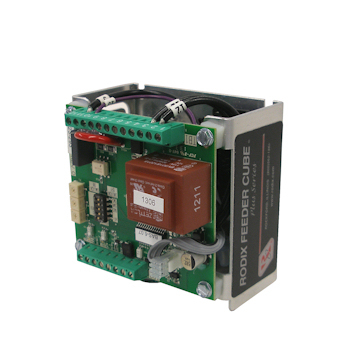 The CE-45 Plus Feeder Cube is a single, open frame FC-40 Plus Series controller designed for installing on a panel in an enclosure. The unit carries the CE mark and a Declaration of Incorporation is provided. Input voltage is 120VAC, 50/60 Hz. It is fused for 15 amps. 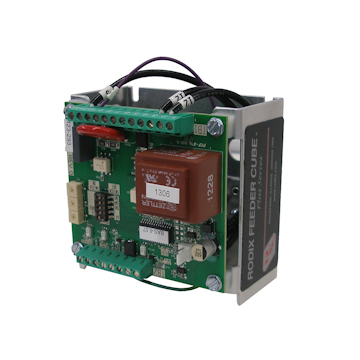 The CE-47 Plus Feeder Cube is a single, open frame FC-40 Plus Series controller designed for installing on the door of an enclosure. The unit carries the CE mark and a Declaration of Incorporation is provided. Input voltage is 120VAC, 50/60 Hz. It is fused for 15 amps.